Have you ever noticed that when you knead dough, it becomes elastic? That’s gluten. It is a protein that is found in wheat and other grains and is responsible for the shape and texture of many baked goods. It is made up of two different proteins called glutenin and gliadin. When mixed with water, these two proteins combine to create gluten particles, which in turn come together to create gluten strands in the dough. The gluten strands become stronger and more developed, the more the dough is mixed. The more the gluten is developed, the tougher and chewier the baked good. Bread, for example, has more gluten than a tender, flaky pastry. Bread dough relies on gluten to hold the itself together, which is why gluten-free bread tends to be crumbly. Bread dough also relies on gluten to trap the gases that are produced by yeast during fermentation. Without gluten, these gases would escape from the dough, resulting in a more dense bread. While bread has a high gluten content, other baked goods, such as pastries, should have relatively low amounts of gluten. Pie crusts, for example, should be tender and not chewy. Take a minute to compare the differences between bread dough and pie dough. 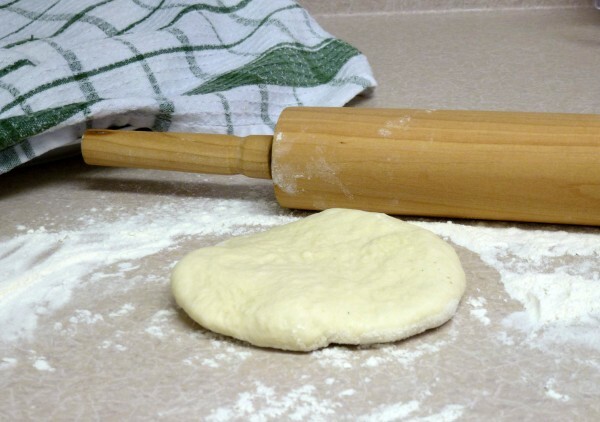 Bread dough is elastic, meaning you can pull it and it will stretch before it breaks. This is not the case for pie dough. This does not mean, however, that the more gluten in bread and the less gluten in pastries the better. If the gluten is too developed, bread dough will no longer stretch easily (think of a really tough elastic band that is difficult to stretch out.) This would result in bread that is too tough and chewy. Pastry dough with too little gluten would be too tender and would fall apart easily. Earlier, I mentioned that the more you mix dough, the more you develop the gluten. This is the whole reason why bread dough is kneaded and pie dough is mixed only to the point where it is just combined. This is also the reason why recipes for cookie dough, cake and muffin batter, etc. often say “do not over mix.” While you cannot undo the gluten development in an over-mixed batter, relaxing the dough can make it easier to work with. You may remember from my puff pastry tutorial, that there are many dough relaxation stages. This gluten-relaxation lessens the elasticity of the dough, making it easier to roll out. The main difference between bread, cake, pastry, and all-purpose flours is the protein content. I think a closer look into these flours deserves a separate post because it isn’t quite that simple, but for now, let’s just worry about protein content. Remember that gluten forms once glutenin and gliadin are mixed with water. This means that gluten itself isn’t actually present in the flour, but rather its components. Therefore, it makes sense that bread flour has a higher protein content than other flours: higher protein content = more gluten. Cake and pastry flours have lower protein contents because we don’t want too much gluten formation in these baked goods. All-purpose flour is somewhere in between. I’ve mentioned before that Canadian flour generally has higher protein content than most European flours. Most of the European all-purpose flour I encountered had a protein content of about 10%. In Canada, however, the most common all-purpose flour brand (Robin Hood) has a protein content of around 13%. This happens to be the same percentage as the Robin Hood Bread Flour.Weird. After realizing this, I looked into the protein content of the Robin Hood Cake and Pastry flour, which is 10%. Most other cake and pastry flours are around 6-8% protein. Just something for my fellow Canadians to think about. Adjusting the amounts of water and fat in a recipe plays a major role in the extent of gluten formation. Water is absolutely essential: no water means no gluten. Fat, on the other hand, hinders gluten development by creating a coating around the proteins. This blocks water from hydrating the gluten proteins, thereby preventing the gluten strands from developing further. After doing some gluten-free experimentation, I’ve found that some baked goods are really easy to make gluten-free whereas others are not. Not surprisingly, baked goods that do not rely as heavily on gluten are easier to make gluten-free. I had a lot of success with muffins, cakes, and some pastries, using various gluten-free flours. My favourite gluten-free flour is Schar Mix Patisserie. I have yet to find this brand in Canada, although maybe it is possible to order it online. Otherwise, it is really fun to experiment with different types of flours. I’ve used buckwheat, rice, millet, chestnut, almond, potato, cornstarch, arrowroot, chickpea, and soy flours. My best results have been from mixing rice, millet, potato, and soy flours together to make some pretty great muffins. Xanthan gum and guar gum are often used to make up for the lack of gluten and help hold the crumbs together. Please feel free to contact me if you are interested in gluten-free baking and I will be happy to post some recipes that have worked for me.